If you just started your mental coaching career or you’re sports-psychologist-in-training, or even an experienced mental game coach, being credible in the eyes of your potential clients MUST be a priority. The more credible your clients view you, the higher chance for your success as a mental game coach. Based on my 25 plus years as a mental game coach, you can learn from my mistakes and successes. About 28 years ago, I was in graduate school at The University of Virginia in studying sports psychology. My training at UVA prepared me to teach sports psychology to students at the University level. When I finished, of course I did teach college students as an assistant professor in sports psychology. I was clueless in the mid 90s trying to figure out how to find my niche. How do I make a living as a mental game coach? Who is my target market? Do I specialize in one sport? Early on, it was difficult to make a go of it. Luckily, I was a mental coach for golfers in graduate school and that helped when I started my own business. But how was I supposed to branch out and make a living in this area? I was not really sure about how to find work with athletes as a sports psychology professional. Should I spend my time writing a book or talking to coaches and athletes? Should I offer my services for free initially? Do I just need to advertise my services to let others know I exist? Should I do a web site? How do you get a website up and running, anyway? Can I really make a living as a mental game coach to athletes? Who should I contact to find athletes and coaches to hire me? How do I find work with athletes and teams? What if I can’t make this career work? Do I need to find a teaching job? Will athletes think I’m a credible mental game coach? And how do I become a credible mental coach like Bob Rotella and Ken Ravizza? Did I have the right credentials? Lack of experience working with athletes as a mental coach. Lack of knowledge about mental strategies. Lack of endorsements from recognized athletes. Other professionals are viewed as more qualified. Lack of reputation as a credible mental coach. 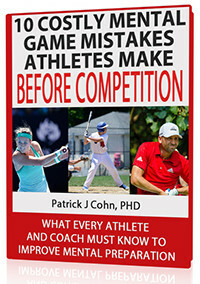 No credentials as a mental game coach (Ph.D., AASP certification, etc.). Lack of sport-specific knowledge or experience. Low confidence in the ability to teach mental game strategies. Lack of proper communication skills to be effective. But I still loved working with the few students I did have, and I stayed focused. OK, fast-forward about 28 years… After countless years of trial and error, frustration, and lots of hard work, I began to understand how to turn my passion into a successful career. Over the years, I polished my programs, learned who I should contact for work, worked on a referral system, and learned how to how to get more work with athletes. I was not an expert in business. Today, I see myself as a successful mental game expert helping athletes reach their goals. I don’t have all the answers and I’m still learning how to grow my business. But I know, without a doubt, that you need to take some basic, but critical, steps to improve your credibility so you can get more work with athletes and teams. How do you think Bob Rotella became so successful with golfers? And why did Ravizza work with so many pro baseball teams over the years? I only have one answer: These mental coaches were viewed as experts in the field of mental coaching, they gained notoriety, and used one critical strategy to catapult them to the top of the credibility charts. I’ve made lots of mistakes and learned a lot of lessons over the last 25 plus years as a mental game coach. Today, I teach other mental game experts, life coaches, and therapists my mental game coaching profession system. with a new manual for mental game coaches…. My new program helps new and experienced mental coaches gain credibility in your field of expertise. 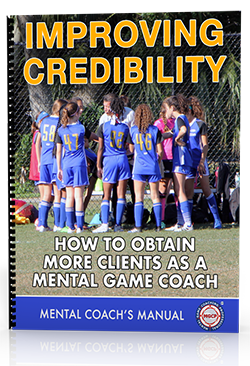 In “Improving Credibility,” you’ll learn how to get organized with your business documents so you can look professional, how to harness social proof from athletes and coaches, and learn the top tactics to improve your credibility as a mental coach. How to get organized with business documents, mental coaching programs, athlete intake forms or coaching agreements, and more. How to define your role as a mental coach. The importance of credibility as a mental game coach. Tactics to building credibility and the steps I’ve taken. One must-have tactic you must do to become more credible in the eyes of your clients. 1. Athlete Intake Forms For Mental Coaches – an example of my athlete intake forms that I send to my athletes before the first session (NOTE: I’m not a lawyer and can’t give you legal advice). 2. Mental Coaching Programs – an example of my mental coaching programs that we send to parents, athlete and coaches that are interested in my one-on-one coaching program. 4. What is Mental Game Coaching? – an brochure you can give to athletes, parents and coaches so they can understand what sports psychology is and how it can help them. (NOTE: We included the title page in both Word and Pages documents so you can add your own logo or watermark). 5. Can You Benefit From Mental Coaching – a one page mental game assessment that you can send to potential clients to identify areas of their mental game that they can improve and help clients identify with potential challenges. We designed this program to help you get organized as a mental game coach and accelerate your credibility. What Are Mental Coaches Saying About My Programs? Who Is The Program Perfect For? A full-time or part-time mental game coach or sports psychologists who wants to gain credibility and expand their mental coaching business. A psychologist or therapist already working with athletes, but who wants to do more with athletes by expanding your market. A student in sports psychology who wants to learn how to break into the field as an entrepreneur. What’s the Cost of Improving Credibility? As a fellow mental coach or coach, you have earned the right to receive the best pricing I can offer. The entire package–including all bonus documents–is only $299.00. Thanks for taking time to read about “Improving Credibility” to help improve your success as a mental game coach or sports psychology professional. Please contact me if you have any questions about the program. ORDER NOW with confidence knowing I stand behind my work as a master mental game coach. If you want to order via phone, call 1-888-742-7225.